We initially planned to be in Denmark for winter last year but we changed our plans to go back in summer instead because we wanted to tour gardens, hike forests, visit beaches and basically just see more greens plus of course we wanted more daylight. Yes, the sun sets at 9PM in the summertime in Denmark and sometimes even 10PM. 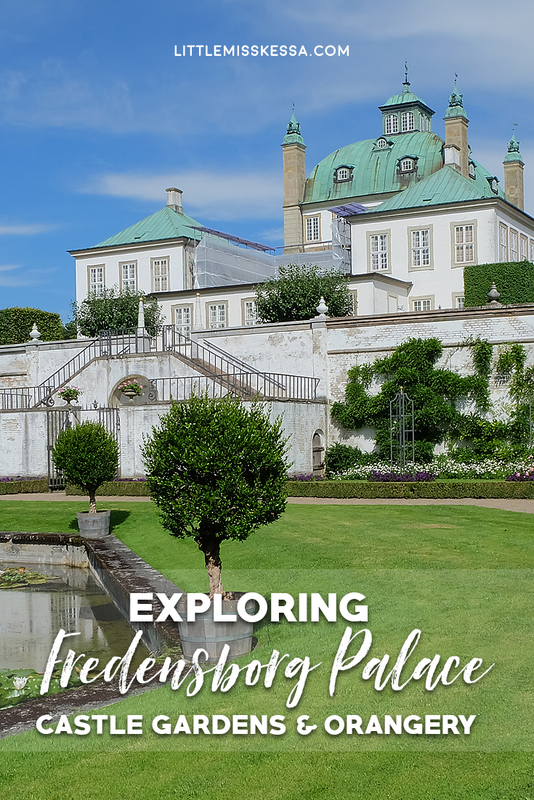 One of our must-visit place in our itinerary is the Fredensborg Palace Gardens and Orangery. I've walked around the castle on my first and second trip to Denmark but I've never been inside the castle and the castle church as well as the garden where fresh produce is harvested for the Royal Family's consumption. There were also flowers and fruits as well as fruit trees. This is the castle's left side and the opposite side where the castle church is. There were some improvements and repairs being done when we were there. Photography was not allowed when we entered the portion of the castle that was open to the public. I had my camera with me though but I was cautious and stayed on the safe side. I didn't want to be reprimanded or worse fined or imprisoned because of a picture. We were also required to wear a plastic cover over our footwear so that dirt will not stick to the fragile floors and carpeting. TRAVEL TIP: Watch out for the glass windows where famous visitors inscribed their signatures/names. I saw the signatures of George Bush, Bill Clinton, Winston Churchill and so much more. The Fredensborg Castle served as the place where the Queen receives Heads of States from all over the world thus the tradition. Queen Margrethe II and Prince Consort Henrik live at the Fredensborg Palace for extended periods of time. This area served as their playground. The location of the palace/castle is really idyllic - expansive greenery and a big lake are nearby. In 2004, the Crown Prince took permanent residence in the Chancellery House. They now live in Amalienborg Palace in Copenhagen. The part of the garden nearest the palace aptly called the Reserved Garden is the Royal Family's private area. They, however, open it to the public every July 1st including the Vegetable Garden and the Orangery. I was so amazed that they had figs and pomelo inside the Orangery.